I am sure many of you are familiar to this book. For those of you who are not, it is an inspirational book about a family on a quest to eat locally for 1 year. The recipe that I followed comes from the their link above but I was unable to cut & paste it. (probably for copyright purposes) So I found another link that had nearly the same directions. The recipe below is from Ricki Caroll. I encourage you to take a peek at the site because it has pictures to go along. I will take better pictures next time. You will need:–A 6 to 8 quart stainless steel pot. Aluminum or cast iron will not work.–A stainless steel or strong plastic slotted spoon.–A two quart microwave safe mixing bowl–measuring spoons–A thermometer which will clearly read between 80 – 120 degrees F.
Prepare your work area:Do not prepare any other food while you are making cheese. Put all food products away. Move all sponges, cloths and dirty towels away from your work surface, wipe your sink and stove with soap and water. Finally use your antibacterial cleaner to wipe down all surfaces. 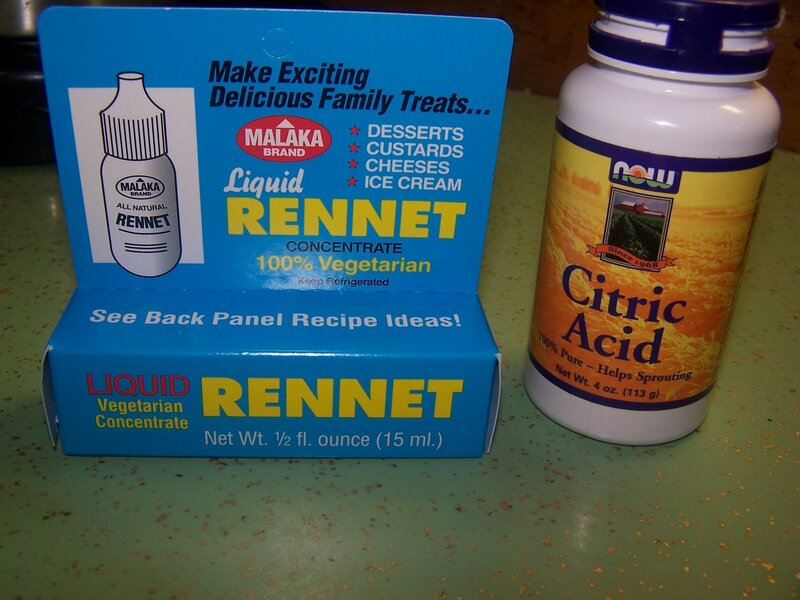 Process:crush 1/4 tablet of rennet and dissolve in 1/4 cup of cool unchlorinated water and set aside to use later. When at 90F add your rennet (which you prepared in previous step) to the milk and stir in a top to bottom motion for 30-60 seconds…then stop. Let the milk remain quiet for the next 3-5 minutes during which it will form a curd. A longer set will result in a firmer curd. Cut the curds into a 1″ checkerboard pattern and then scoop with a slotted sp0on into a heat proof bowl to be used in the microwave. (If the curd is too soft at this point let sit for another minute or so)You will now press this curd gently with your hand, poring off as much whey as possible. Reserve this whey to use in cooking or making ricotta. Microwave 2 more times for 35 seconds each and repeat the kneading as in the last step. Drain all of the whey off as you go. Knead quickly now as you would bread dough until it is smooth and shiny. Add salt near the finish. At this point the cheese should be soft and pliable enough to stretch like taffy. It is ready to eat when it cools. Form it into a ball and drop into ice water to cool and refrigerate. When cold you can wrap in plastic wrap and it will last for several days but is best when eaten fresh. Option:–A substitution of reconstituted dry milk and cream is very viable and is a great option if you can not find the right type of milk–Lipase may be added to the milk to provide a typical italian cheese flavor–If you want a softer texture, do not let the curd set as firm and work less when draining and kneading.. this will make a moister cheese. This recipe is called “30 Minute Mozzarella”. And if you read the directions closely (I did not…no big surprise there) it is quick and easy! This entry was posted in cheese making, farm adventures, Local Resources, recipes, self-suffiency by Achorn Farm. Bookmark the permalink.